A growing number of companies are using hosted services platforms to carry out voice-based authentication. A hosted approach provides them with levels of flexibility, affordability and scalability that premises-based approaches do not. They help “future-proof” implementations, making it easier to add applications, enrollees and “hooks” into complementary security and authentication infrastructure. 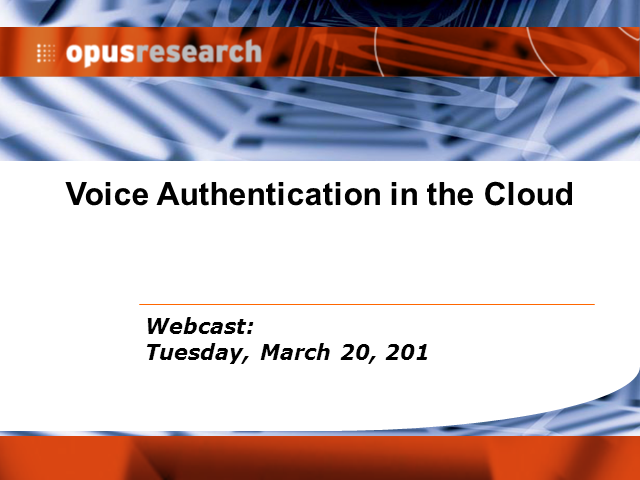 Join Opus Research, Voxeo and Voice Biometrics Group in a webcast that describes the demand for strong, context aware authentication; the variety of voice biometrics-based solutions; and the advantages of taking a “hosted approach” to meeting identification and verification challenges in ways that comply with security and privacy concerns associated with Financial, Healthcare, Insurance and Government Services.